Mr. B.R. Chopra was always known as a motivated director his movies spoke of social issues that needed to be touched. With a keen eye for visuals he was a master at plot development. For Mr. Ravi Chopra he is not only his father but a guru and a man he loves and respect is more than anyone in the world. At a time when entertainment was paramount in cinema he took the role of a crusader and always made socially relevant films. He always made films he believed in &amp; tackled so many ills of society much before people had even started to talk about them. 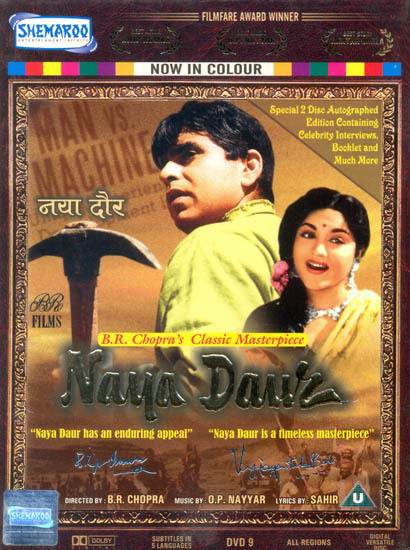 In Naya Daur he took up the classic problem of Man versus Machine the script was dismissed by all the pundits lf the industry &amp; was passed off as documentary. He went on to make the film. Naya Daur has entertained India fro the past 50 years and will continue to do so. Dilip Kumar’s words on Mr. B.R. Chopra he reasoned with his mind &amp; heart when he developed characters &amp; Situations. I was always happy to accept his logic during filming. Vyjantimala’s words on Mr B.R Chopra Naya Daur was very progressive. B.R. chopra was known for his progressive subjects. To work under him was great experience. It was a spirited role and in those times it was a powerful role to stand by the man and go through everything. It was wonderful opportunity. A story about love, friendship &amp; social justice, Naya Daur tells the tale of two friends, Shankar the ‘tangawala’ &amp; Krishna the wood cutter, who turn foes over the love of Rajni, Conflicts arise when Kundan the city bred son of Seth Maganblal in his greed for quick, profits mechanizes the saw mill and brings misery to the once happy village of Karanpur. The incidents which then unfold give rise to an emotional and economic upheaval that provides the dramatic thrills and the story’s moral; that it is wrong to misuse the immense potentialities of the machine to create prosperity, by making it create money for the sake of a few and generate unhappiness and misery for thousands. Watch the action that unfolds as Shankar unites a divided village, and how he sets about to keep his faith in winning this race between man and machine. Shemaroo Entertainment Pvt. Ltd. Is an Integrated film Production. Post Production. Distribution and Animation Player. Over the past four glorious decades in the entertainment industry. Shemaroo is armed with a veritable archive of Hindi films and has penetrated in to cable and Satellite TV scene, offering films for exhibition on various network. To bring its excellent library of movies to million of small screens spread across the country. Shemaroo joined hands with Sony entertainment Television. Where we are a joint venture partner with Sony Pictures Entertainment USA for more than a decade. Over the decades Shemaroo has successfully leveraged new technologies. Broadband, internet, IP TV Mobile and other emerging technologies are just a natural extension of distribution platforms. Shemaroo is posed for accelerated growth in the exciting entertainment industry through forays into film production animation and international distribution among other business. Shemaroo has also made a direct foray into film making with its Films Division. The critically acclaimed award winning Omkara co-produced by the pipeline shemaroo’s first film in the regional category Majha Navra Tujhi Baiko was highest grosser movie in the Marathi Cinema for the year 2006. Apart from this the Bengali film Anuranan Being hailed as the new wave of Bengali Cinema is yet another Shemaroo banner. Shemaroo has taken classic Bollywood Film across the seas and around the globe to Hindi film fans all over the world. The demand for shemaroo produced has been phenomenal not only in the US. Uk. Singapore Fiji. U.A.E. and Australian markets but newly developed markets like East European &amp; North African Markets as well. The company has state of the art studio facilities equipped with highly sophisticates studio hardware &amp; software and Shemaroo is today a one stop source in professional production and post productions services for the entertainment industry. We promise to continues providing wholesome entertainment and quality content to audience all over the world! 9. Song 3: Ude Jab Jab Zulfen…. Good DVD but false advertising. I was promised a 2-DVD set. I was only delivered one DVD. Good DVD. Color movie is good quality. However, there is a bit of false advertising. The product description promised me a 2-DVD set. I was only delivered one DVD.